Italian king of drones, Oophoi aka Gianluigi Gasparetti, offers us together with Databloem/Practising Nature this stunning collection of lost, forgotten and rescued pieces from his own extensive archives. I think there is no need to introduce this master of airy, serene and gloomy minimal, but delicately graceful, magnificent and expansive atmospherics. Even if I am one of Oophoi's die-hard fans, I was missing many of his original CDr editions from his own Due Acque, Umbra and Penumbra output released mostly during 1998 - 2006. Databloem/Practising Nature has already released during the last two years several of Oophoi's rare recordings in remastered and reissued editions. 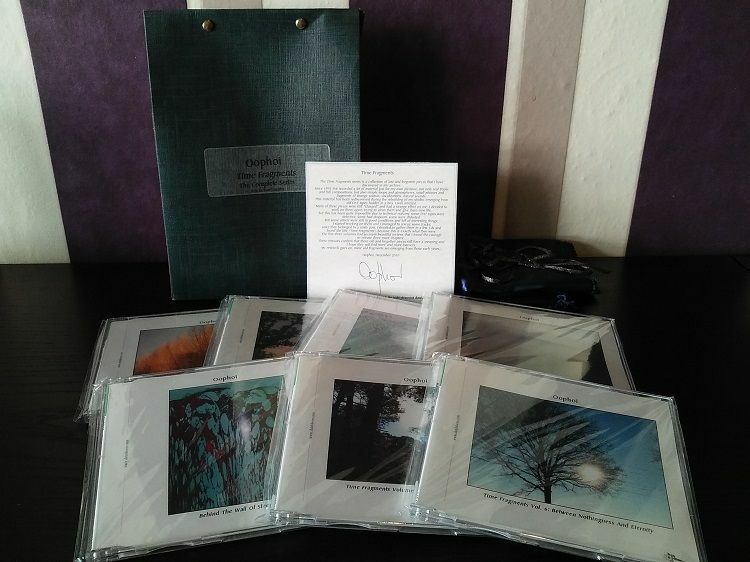 Now it's time for this "creme de la creme" collection featuring complete "Time Fragments" series on 6 pro-CDrs plus another remastered and reissued album "Behind The Wall Of Sleep" as bonus. All 7 CDrs are wrapped in dark blue satin fabric, add to that signed personal note by Oophoi and all packed in dark blue cardboard bag closed with two copper split-nails. Each bag features printed edition number and even the name of its owner, so I couldn't ask for more... Sonically, the music in this collection has wider range, it floats from more lively compositions supported by various flutes, chimes, bells, gongs, stones, shells, singing bowls, processed voices... to more droning minimal, slow motion, long form, calm and cavernous pieces. Oophoi's soundworlds are unmeasurable, relaxing, meditative, mysterious and always effective and transcending beyond the gates of the real world. Highly recommended voyage!!! I understand that I have focused in this review more on the visual side of this collection, nevertheless I hope few other readers will find their way to explore immersing ambience of this prolific sound sculptor. Big thanks to Gigi for rediscovering all these old pieces, to Dennis for his ongoing support and belief and also to Eric for his beautiful photographs. By the time I am writing these lines, this Box Set is probably sold out as it comes in very small run only, but all individual albums are (or will be shortly) available by Databloem and also by the master himself.